Does your People & Organisational Development Strategy need a refresh? Is your People and Organisational Development Strategy balanced ? I was first introduced to the Burke- Litwin model for organisational performance and change in my early career while working in an internal consultancy group in the late 1990s for the then Chase Manhattan Bank now JPMorganChase. We used the model to help inform our change initiatives, particularly the merger of Chase Manhattan Bank and Flemings as was. 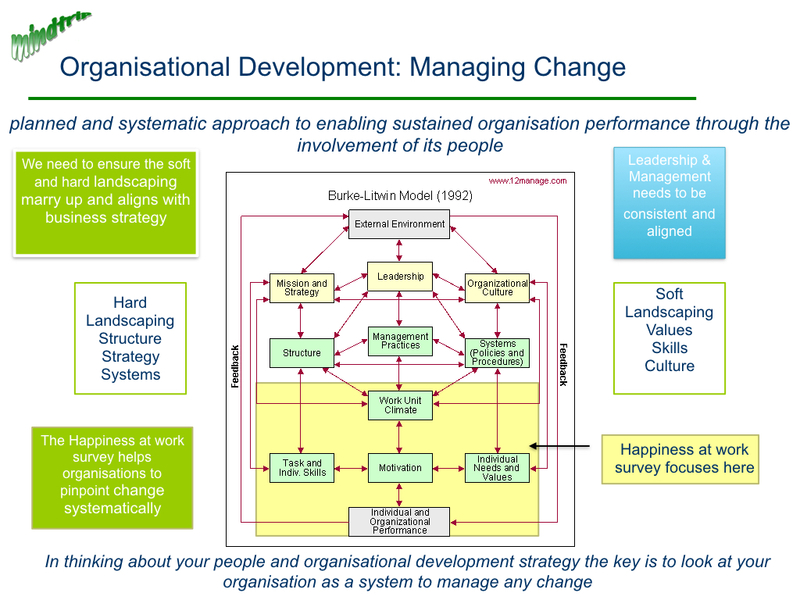 The model, written up in a paper in 1992 was particularly focused at looking at both Transformational as well as Transactional change, the balance between external and internal drivers for change and what i have called the hard and soft landscaping- the structure, systems and strategy versus the softer values, culture and leadership approach within an organisation. Spring forward 15+ years and I am currently working with a client where we are putting the model to good use in pinpointing change as part of the wider system in their workplace. Having undertaken a Happiness at Work Survey and combined this with the organisation's intentions for the next 3-5 years we are working on putting together a People and Organisational Development Strategy that focuses on both the 'hard' and the 'soft' stuff. As the paper concludes many organisations can get focused on the left side of the model to drive performance and behavioural scientists with the left side. What in fact we need is both! Based on the latest research on wellbeing and happiness in the workplace combined with business school thinking I can work with you to put together a People and Organisational Development strategy that 'joins the dots' of what can often be an eclectic mishmash of People Development initiatives within an organisation. So if you are an individual, blue chip organisation, small business, startup, charity, school or government organisation I may have something to help. All prices are tailored to sector and ability to pay. Curious? It would be lovely to reconnect with those that I haven't spoken to for a while even if you don't have an immediate need! Copyright © 2017 mindtrip, All rights reserved.